It’s really Scent of a Few Hours Before Bed Last Night, but when I woke up this morning and tried to decide whether to hit the perfume cabinet directly, or wait for the mail delivery in a few hours, I realized that my sleep scent—Balsamo della Mecca— is still going strong. Back in February, Kevin over at Now Smell This reviewed BdM; the review was such that I instantly jumped in on a split for the fragrance (which may have been my first split, but that’s another story). When my 10mL atomizer arrived, I received it with mixed feelings. This requires a little history. I lived, for several years and over a few different periods of life, in Eugene, Oregon. Eugene has enough of a reputation that it probably doesn’t even warrant an explanation, but the fact is that Eugene is famous for hippies. Hippies that wear patchouli and resinous oils such as opoponax, olibanum, amber, and sandalwood. Each of these notes has not only ancient importance in perfumery, but is very beautiful. However, the association of these scents on a filthy, sweaty, antagonistic body, damaged the scent memories for me—almost irreparably. 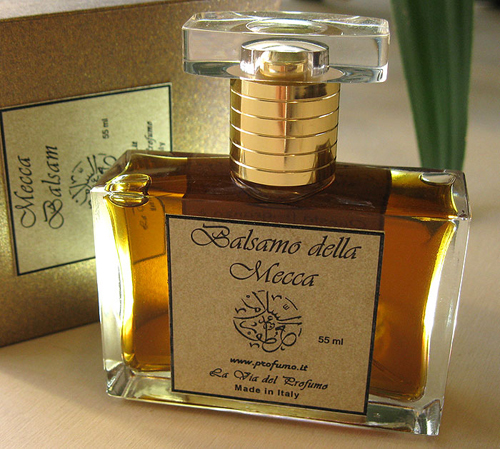 When I first got a whiff of Balsamo della Mecca, I was transported to an unpleasant place. I’ve spent some time re-training my nose, and can finally tolerate—no, even appreciate—patchouli in perfume (that was the biggest offender). Prada EDP was the first step in what has become the “taking back” of my senses. Amber has become perhaps my favorite perfume note, and opoponax and olibanum are code for “smell this!”. Today, eight months after first sampling BdM, it’s a treasured favorite whose golden drops are spent with a careful eye. The smoky-leather opening is a delight, and the sweetly resinous drydown—which lasts greater than 12 hours—is decadent. I don’t find any real distinction in the phases; at first the sillage is mid-distance on me, and I’m calling that the top notes. After the first half-hour or hour, you’ve got to be very close to smell it (insert wrist-to-nose motion here). I call that the base. It’s probably on the more masculine side, and I find it both sensual and comforting. Notes, compliments of Kevin: cistus labdanum, frankincense, benzoin, agarwood, tonka bean, tobacco, Indian tuberose and Damask rose. Buy it from Abdes Salaam here, or at The Perfumed Court. Next Saturday Mail: new perfumes!